I have shared this stat before but it is significant (and shocking) enough be worth sharing again: buildings account for 40% of the world’s energy usage. Understanding this fact underscores the importance of the building management and facilities industries to humanity’s ongoing quest to reduce its energy consumption. With all the talk about human-induced climate change, much of the attention is given to green energy generation and electric cars. 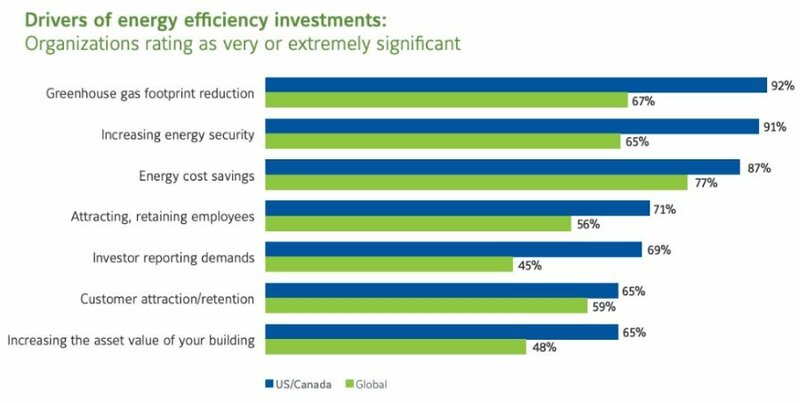 Both of these trends are important but neither can immediately advance our greenhouse gas emission goals as quickly as reducing our energy consumption at the building level. As you can see, governmental incentives are the most important factor in spurring these improvements. It seems that respondents from the U.S. and Canada are particularly interested in these programs as they put a much higher weight on them than the rest of the world. Benchmarking and certifications are also a huge factor, particularly internationally, showing that education and accountability can be a powerful tool when government incentives might not be an option. HVAC improvements are an easy way to move the needle immediately since so much of this energy is unnecessarily used or lost due to inefficient buildings. Looking forward those answering the survey saw a bright future in green energy generation: “When asked about planned investment over the next twelve months, onsite-renewable led the way with 60% of respondents indicating they would invest. 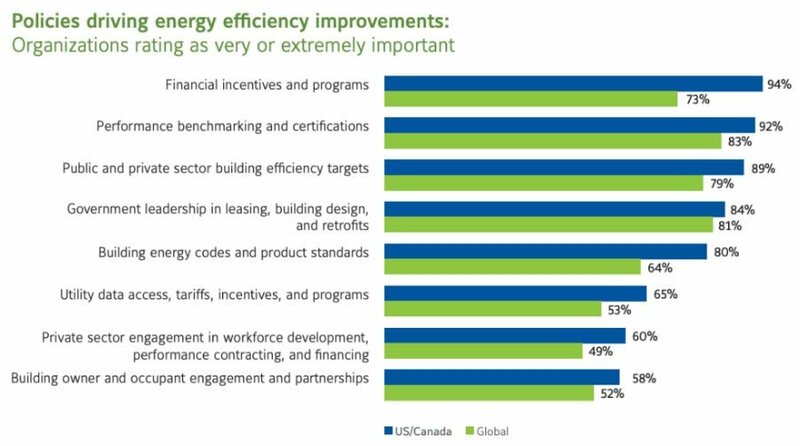 It was followed by energy-focused behavioral programs (52%), heating, ventilation, and air conditioning improvements (51%), and building systems integration (48%).” If this holds true then we will likely see a lot more technologies that find ways to harvest and create energy where it is consumed, at the building. The industries that create and run our buildings are pragmatic but not completely deaf to the environmental issues that are being hashed out in our collective conversation. Saving energy has always been one of the most controllable costs for any building manager but now it is seen as not only good business practice but a social responsibility.